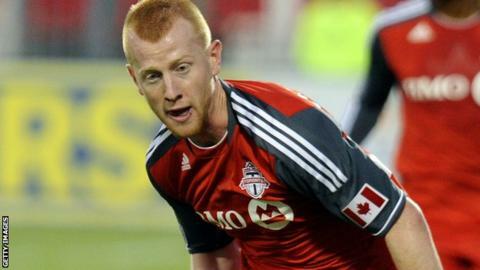 Oldham have signed full-back Richard Eckersley on a free transfer and Swansea midfielder Jay Fulton on loan. Former Manchester United trainee Eckersley, 26, was released by MLS side New York Red Bulls last December. Scotland Under-21 international Fulton, 21, joined the Swans from Falkirk in 2014 and has played four league games, the last of which was in February. They are the first signings made by interim manager David Dunn and have both agreed three-month deals. "This is my home. I live in the city centre, my family is all in Manchester so it's perfect for me," Eckersley told BBC Radio Manchester. "New York was a great experience but I'm happy to be here and start working."